I went to see my brother in Austin while my wife attended a writing conference there, which seemed to go well. They took me around to see the usual suspects for a plant type, the Botanical Gardens and a really neat nursery. I picked up a plumeria there, which I never realized that it was the same as a frangipani, a yellow one. 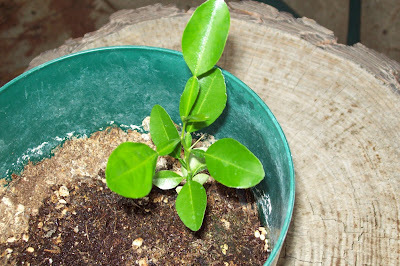 I brought him a couple key lime trees which he already had one but it went through a tough winter and shrank a little. 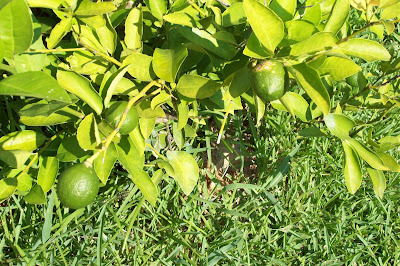 While I was there I picked some really nasty leaf eaters off of his key lime tree and took pictures of his lemon tree. 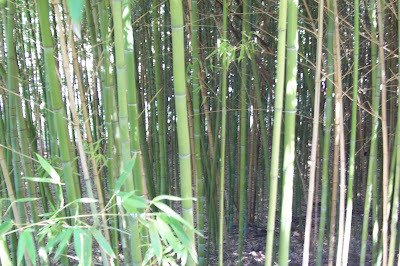 While at the gardens I saw some great hibiscus and bamboo, both of which I adore, but my wife says that invading the city with bamboo is somehting that probably wouldn't be appreciated. 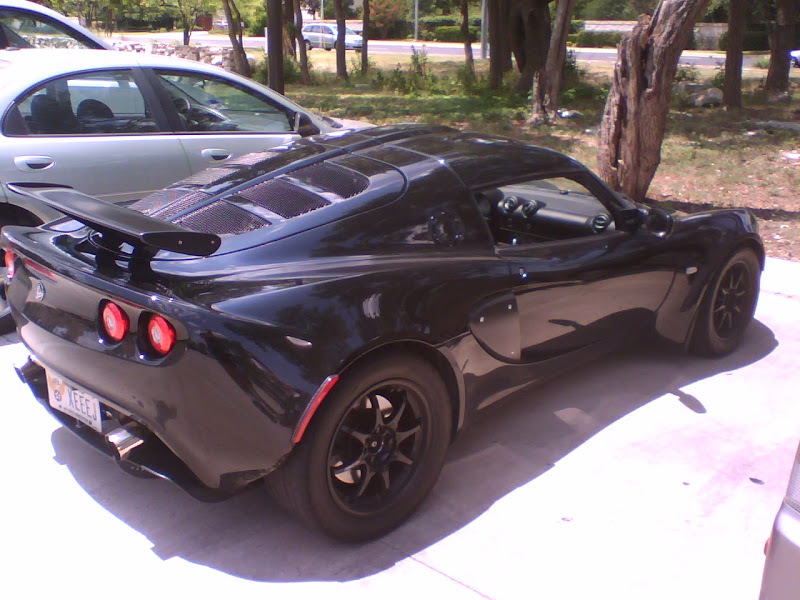 I know this is a gardneing blog but upon leaving Panera Bread I saw a most lovely flower named thing that can only be appreciated by seeing it, too bad I coudn't drive it. There's more to it, but below are pictutes from the roof again. This time it's of the front gardens. I've placed them so they are in order. The top edge of the top picture is the street we live on and the right side is our driveway. The tree shown is a 9 year old oak that came with the house. I can only estimate it's age from what our neighbor tells us. The bottom of the bottom picture is the walkway leading up to the front door. 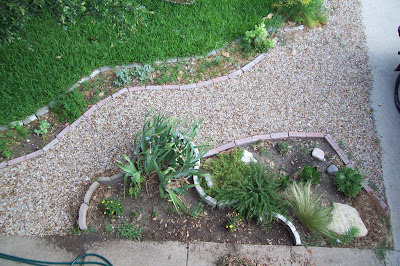 The right side is our rock garden and the left side next to it has our pepper plants, mums, hyacinth and iris. 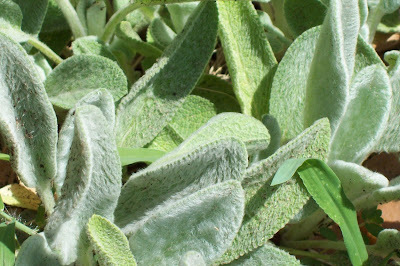 The planting strip along the upper part of the gravel walk has lamb's ear, parsley, lettuce, cabbage and sage. 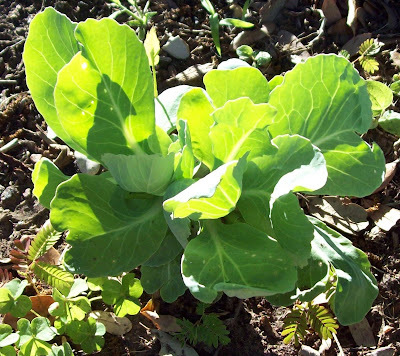 The lettuce can be seen in both pictures. On the corner of the drive and street there are two small lavender bushes. Too bad most of the plants aren't recognizable here. 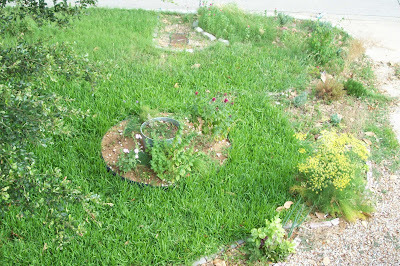 The middle round area in the top picture is where we decided to put the mint, chives, and other assorted herbs. My sunflowers have started to die back and produce some seeds!I wasn't really sure if they would or not so I'm happy to get at least something. I estimate at least 4 or 5 hundred seeds from this years showing of so far 8 flowers. There are some small buds but I don't really expect them to survive the July heat. If they do...wow...who knows how many seeds they will produce. I might have to start a stand at the local baseball field (Ranger's Stadium), or maybe not. I'm still waiting to see if some of my root vegetables will seed. Hoping for the carrots and beets so I don't have to buy more seed next year. 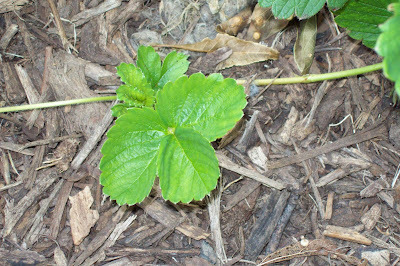 The strawberry plants are doing great too. 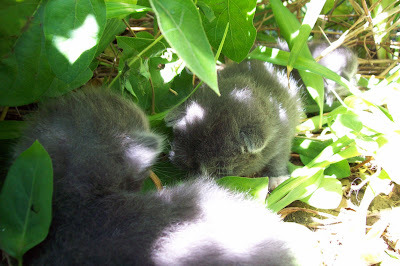 I really have to get these pictures up sooner though, I already ate these and there are now more to pick. If anyone will be at the Fort Worth plant swap, these will be transplanted into pots this week and will be available for trade. It's shooting off a dozen runners or so. I really want to call it a tree. It wants to be a tree. Maybe I should put it in a pot big enough that it can become a tree. So far as it can it's still growing very well. It will be outside until the first frost of the year, or possibly the first frost of next year since it sometimes doesn't freeze until January. Then it will be my perfect little houseplant unless the beast of the caves, one of my cats, gets hold of it. For those of you who might be wondering, I still haven't divided the key lime sprouts yet, but I'm getting to it, eventually. They will be ready for the Fort Worth Plant Swap this fall each in it's own little pot. Hopefully I can find people who will give me updated on how the plants are doing and where they have been placed. My guess is that most of them will die if left outside but I'm also guessing that most people will bring them in for the winter or put them in a greenhouse. As far as the kaffir lime tree goes, it still doesn't look like one entirely but I still have a little hope that it will turn out beautifully. 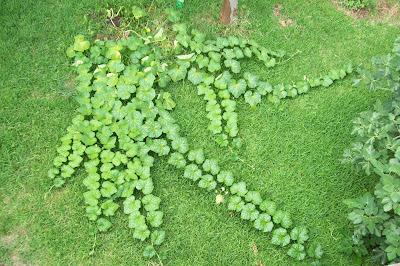 Our squash plants have really taken off this year so I decided to take a picture from the roof. You can see in the picture that it is deciding to take over part of the yard. I got this plant from seeds in a slice of squash I got from Fiesta Marketplace and tried to make something out of it. I don't remember what exaxtly but I remember it didn't turn out right. After a good rain a few weeks ago the vines started to make roots all along near the leaves. Maybe if I let it keep going it'll finally make squash bigger than my toe. This is a picture from the roof and the plant to the right is our fig tree. It's about 12 feet across. This isn't about her picture in the garden but instead the way she takes pictures of the garden. I think she does a better job sometimes. We compared style once when she was taking a photography class at Lamar University in Beaumont and we decided that I'm more abstract and she's more focused on her subject and how to make it look good. Just making sure the feed works. Or maybe not since that reminds me that I really need to feed some of my plants. This is something that I don't really do very well at. Fortunately some of my plants don't seem to need any feeding, but even then they would probably do much better with a feeding every now and then. 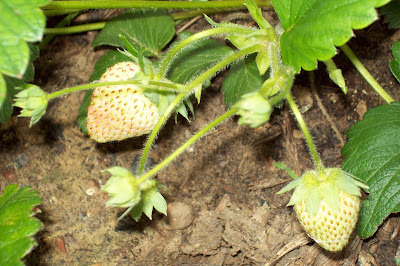 My strawberries for instance are producing alright still but my wife has really wanted to make some preserves again this year and I really don't want to have to go somewhere else again to get the berries so I guess it's time to feed and really pop thost berries out. Again speaking of feeding, it's time for lunch. Just to cover my bases, I am not a doctor. That said there are two things that are not usually known that I can think of off the top of my head. First, Figs are said to be good for genereal testicular health. Second, Beets are said to be good for general prostate health. As a rule of thumb, although I don't know what would be particularly good for general thumb health, the vegetable or fruit you eat often looks like the thing it is helpful for. One last example is carrots for the eyes. If you cut a carrot end off and look at the cut end, it looks like an eye. If you want to know about any other part/ailment/plant just ask, although I just might start posting them regularly anyway. My wife had been trying to find oxalis for some time. 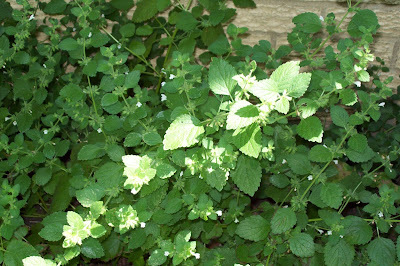 Finally one of our good gardening friends mentioned that she had quite a lot of it growing in her back yard between the cracks of her patio. 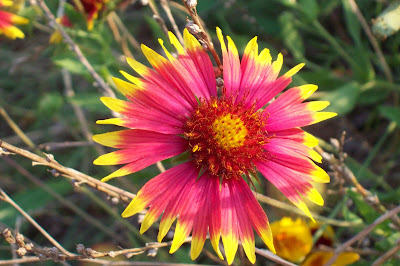 So we went to get some and planted it in our back yard among the clover we already had growing there. It's really amazing how many places it has spread to in such a short time. 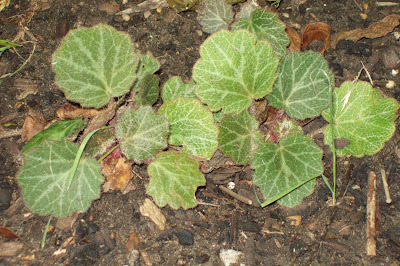 We have since found it growing some twenty feet away near the back fence and in a hanging pot. If I ever figure that one out I'll let you know. 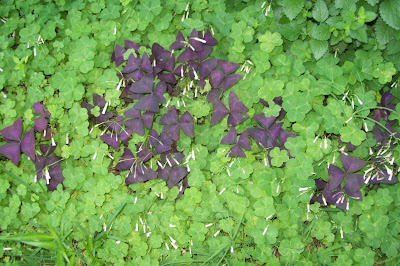 It's a wonderful contrast to the clover though as the color pops among the green. 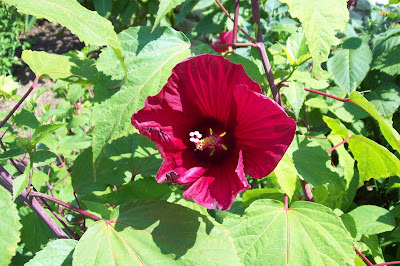 Just thought I would post a few of the flowers I have grown and seen recently. 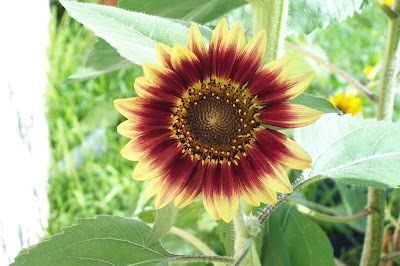 The first one here is a burgandy sunflower. 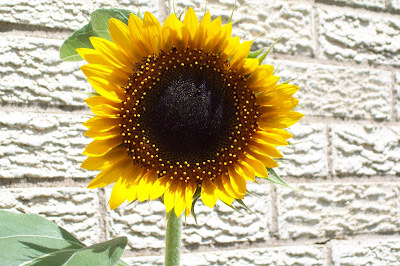 It's growing alongside the house with other sunflowers. It came out of an assortment pack I was given. 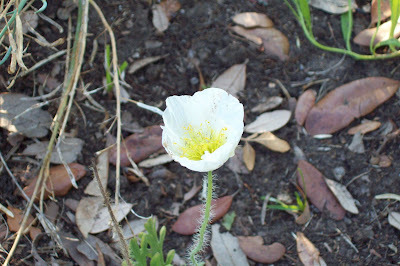 This is a poppy flower. It hasn't made any seeds yet but it's flowered a few times this year. The broccoli and lavendar plants make a good backdrop for it. 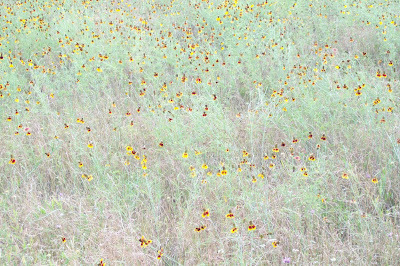 My wife and I went to the park and walked through the wildflower area. I took a close up picture and an overall so you can hopefully get a better picture of what it must have looked like. 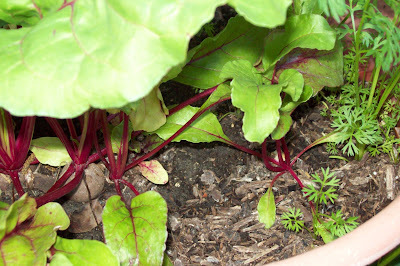 The great thing about beets and other root vegetables is that you don't have to wait for it to flower, polinate, mature, etc. You just water it and once it gets big enough you eat it. Not only can you eat the root, but the tops are really good in salads. I already have several beets big enough to eat. I'll leave some of them in the dirt to make more seeds for the fall though. Last night it rained, heavily, and the roof of the greenhouse decided to let some of the rain in. It's really not much of a greenhouse since there are very few plants in it but the rain was good for the rest of the garden. In fact it's probably the first good watering my ginger has gotten since it was planted. Sure I watered it a little now and then but it never got a really good soaking. It's part of the master plan for the back of the house as a kind of wall for the rest of the shade plants. It's on the side where there's nothing to block the sun except for the fig tree which isn't really big enough yet to fully do the job right. All I started with was a bit of root left over from cooking. I planted it in a pot inside and it grew for a while during the winter. When spring came I took it outside and the leaves all fell off. A few weeks ago however it shot up again and seems to be doing well. I really don't like cats in the backyard since they like using the onion/garlic/potato and strawberry patches as their personal litter boxes. Unfortunately when there are kittens involved i just can't be upset. It's natures way of making sure you get suckered into taking care of something that will one day only wat you for the food or to scratch an itch. 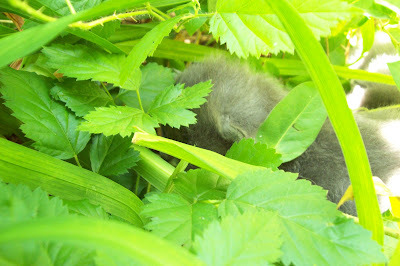 Here are some pictures of the adorable little things among some blackberry and daylilly plants. They cuddle up in some half burried cinder blocks during the hot part of the day. 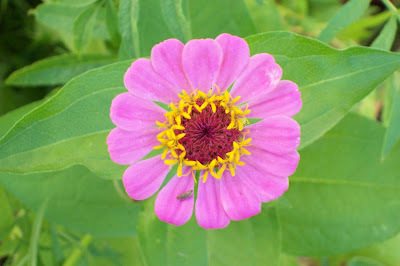 We planted zinnias last year in the front yard by the street near our water meter which we surrounded by rocks. They seeded themselves quite well in that bed as well as a couple surrounding beds, some beds no where near the area, and in the backyard in several locations. 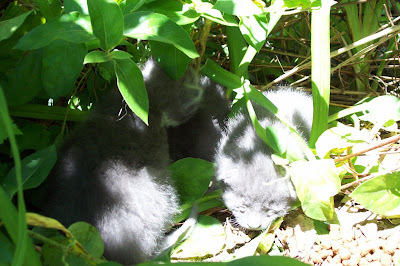 Fortunately they're not very big and like to sprout in the shade. When I first started gardening my grandfather had rows of grapevines that he had just started. He didn't quite know what would happen even though he had been gardening for most of his life, I believe he was in his sixties at the time. My mom was the baby of the family and I am her yougest son (no I won't call myself a baby...) Anyway he set them up on the west side of the house and they grew but produced no grapes the entire time he kept them. I don't think he ever figured out why but I do know that he never told me. Now, I love grapes almost as much as I love banannas. Not really because I love everything I can think of that has banannas in it, but that's another post. So, when I grew up, or at least older I figured that I would grow some grapes. This hasn't happened yet but I do know a lot of places where they grow wild in the area, something else I won't tell you. I wanted to have some close though and one of our great friends gave us a vine for our backyard. It will most probably grow grapes since it's parent plants produce grapes in her yard. 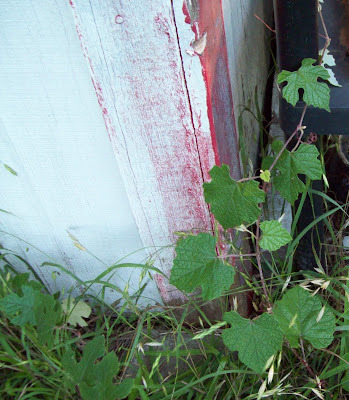 I have since put it by the shed on a corner and water and baby it more than some of the other plants we have so someday soon I expect to have grapes of my own. I feel it's way past due for the key lime update. They will indeed be ready for the fall plant swap as well as a gift or possibly a trade with one of our friends. I have still counted over a dozen plants, all of which are doing fine. 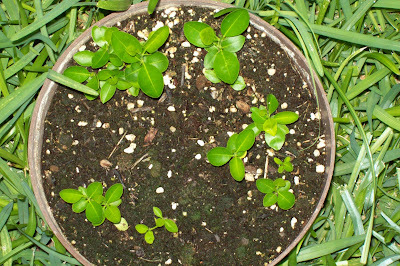 My kaffir (kiefer) lime sprout is also doing well but still not producing the sought after leaves. I hope my plot to produce the plant from seed isn't being foiled by the growers. As for the lemon tree, it's growing by leaves and bounds... no gagging please, it might hit your keyboard. As I have said the cabbage stalk, that is the bit left over after you pull off all of the leaves is still sprouting new leaves, but this time I have pictures! One of the reasons for having a blog is the ability to put up these pictures. Soon there should be enough cabbage with this and the other stalk that I don't have a picture of to make some more food stuff. I really didn't know what to expect when my wife came home and told me about the new plants she had bought, to of which were lavender cotton plants. They look like they're a little lavenderish but not really. Now that they've finally bloomed they look even less like it. 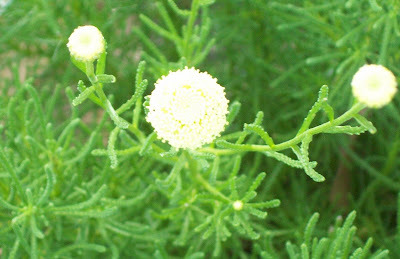 They make pretty little flowers though and it's a nice accent to the front bed and they help with the fragrance especially right after a good rain.